Add this shop to my favorites. Very nice model of four-masted boat towed by a tugboat, sailing in front of a village dominated by a lighthouse nestled on a rock, folk art work of the late nineteenth and early twentieth centuries. This model is in good condition, it is in its own juice. A note: a piece of mast is broken and moves in the bottle, the paint of the sky is damaged, some small bubbles and scratches on the glass, see photos. 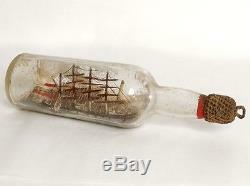 We are selling a whole collection of models in bottles on this site. We can also ship this bottle by carrier (ziegler) on request and quote. Diameter: 7.5 cm length: 30 cm. The item "model boat 4 masts bottle diorama village lighthouse tug ship xixè" is on sale since Friday, January 10, 2014. It is in the category "art, antiquities \ objects of the nineteenth and before". The seller is "antique-delaval" and is located at / in valves.